Mary Unger planned a career search during her senior year just as she has approached most any other goal in life – with tenacity and creativity. And, the result of that search mirrors the results to many of her endeavors – success. Unger, who will graduate May 14, has accepted an offer with Apple in Nashville, where she will be an associate in the Apple Store Leader Program. It is a 24-month immersion to learn every aspect of managing and operating an Apple retail store. At the end of the program, she’ll have the opportunity to secure a leadership position at one of the Apple stores anywhere in the world. “When trying to figure out what I wanted to do after graduation, I had a variety of plans in mind, but I wasn’t sure specifically what I wanted to pursue … so I decided to just start looking around,” she said. 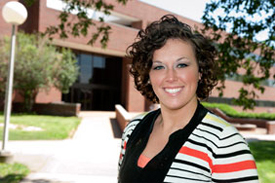 She also learned that she didn’t necessarily have to graduate with a specific degree from UT Martin; instead, companies considered her employment history throughout school, how active she was in organizations on campus and her overall grade-point average. 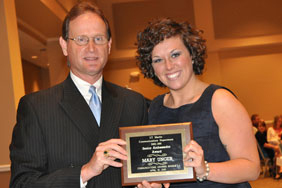 While a student, Unger claimed a number of awards, including Outstanding Communications Student for two consecutive years and the Spring 2011 Beth Maloan Outstanding UT Martin Student Employee Award. 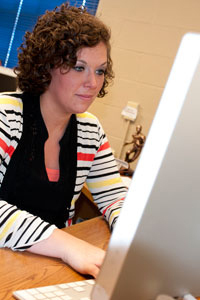 Her most beneficial experience was provided by the UT Martin Office of University Relations, where she worked as a student intern for two years. “It not only expanded my portfolio and taught me great skills in writing, but it allowed me to be surrounded by individuals that had similar mindsets and had the same passion for communications that I do,” she said.